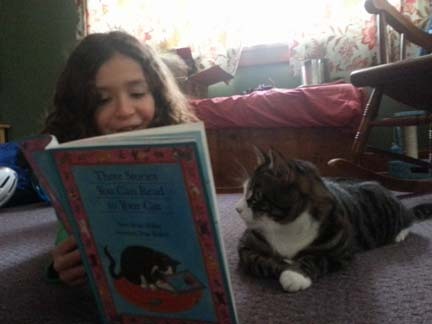 Madison Deljoo, age 8 of Ithaca, reads to her cat Jack, who looks on with great interest. Reading to an animal is a non-threatening way for children to practice reading aloud. Read to a dog? Read to a cat? Yes! That can be just the thing for a beginning reader. Animals love the hugs and petting they receive when they are paired up with early readers. And children love having a non-judgmental audience when they practice reading. If you have a pet at home and a child just learning to read, see what happens when they are together sharing a book. Pick a time when your pet is relaxed and resting and your child can sit nearby and read aloud. If you don’t have a pet, try a stuffed animal sitting on your child’s lap, “listening,” without interrupting or correcting. For an animal visit, kids usually choose books from what they have at school, because when the children read what they are already know well, it helps build their confidence. If a child needs help with a word while reading to their animal, they can skip over it or the animal handler, classroom teacher, or aide can offer a suggestion. One volunteer, John Martindale, regularly brings his show-dog, a Rottweiler named Tank, to listen to children read at area schools. Martindale says that when children first see Tank they are a little intimidated by his 110 lbs. size, but then the children get to know him and some even lie down with their head on him, using Tank as a pillow when they read. Sometimes Tank pays attention, but other time he rolls over on his back and falls asleep. When Penelope the rabbit comes to schools she sits very quietly; and when the llama visits on special occasions, she gets a lot of petting before children settle down to read. It’s all part of the read-aloud experience and helps children see that reading is fun to do. “Three Stories You Can Read to Your Cat” by Sara Swan Miller, illustrated by True Kelley. “The Rainy Day,” “The Yummy Bug,” and “The Good Day” are three short stories about all the things that could be a part of your cat’s day–nibbling plants, sharpening claws on the rug, diving into the garbage, and stalking insects. The humorous text accurately portrays the finicky, quirky nature of felines. The “McDuff” books by Rosemary Wells, illustrated by Susan Jeffers, are about a little Westie dog that will steal your heart with his adventures through seasons and situations. The expressions of McDuff, with head cocked to the side in an inquisitive look, will be familiar to anyone with a lap-sized dog. “Biscuit Goes to School” by Allyssa Satin Capucilli, illustrated by Pat Schories, is an “I Can Read” book especially for beginners. Biscuit is a little puppy who wants to do everything like his owner, including going to school and listening to stories! Very few words on each page help keep the attention of young children practicing reading.